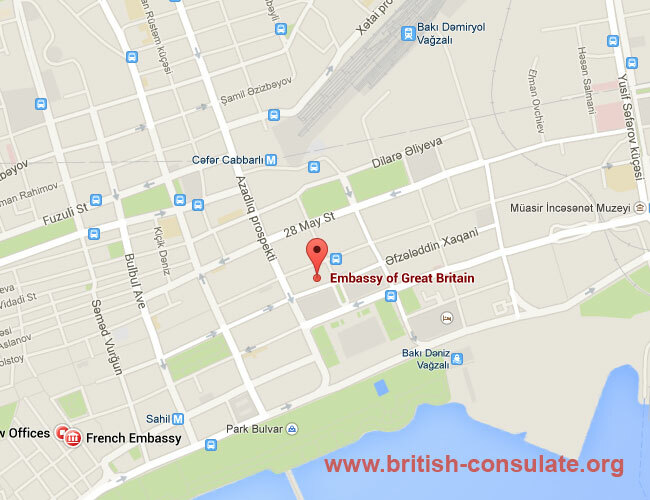 The British Embassy in Azerbaijan is in Baku near the Landmark Hotel. The British Embassy in Azerbaijan can issue you with a passport if your are a British national. They can also arrange for a fiancee visa for your girlfriend or a spouse visa for your wife if you are married. You can also register your child born in Azerbaijan when still abroad. The telephone number, street address and a map has been added below so that you may locate the embassy in Baku. Also listed is their operating hours so you may visit in person or email them if you need more answers. The following days the British embassy in Baku is closed. The dates are a mixture of British and local holidays. Call the embassy in Baku before you go the the embassy to ensure that they will be open on that day. We have made a list of public holidays in Azerbaijan and also mixed with the Embassy days. As an example you will note that the National day of Azerbaijan is not a British holiday however the embassy is closed on this day. If you are applying for a UK visa while in Azerbaijan then consider the following. The visa processing times varies in Azerbaijan when you are wanting a British visa. Speak to the embassy in Baku if you are wanting to immigrate to the UK or wish to visit the UK while on holiday in the EU. Like every embassy email normally works the best if you want a fast response time to your issues.